Glen Hansard (the Swell Season) belts out a chilling version of Springsteen's Drive All Night. Edward Norton introduces and sits in with Glen Hansard as he sings Bruce's Drive All Night at Crowdrise benefit on March 22, 2010. Glen Hansard says: "Help me raise money to get my Maasai friends a truck. It will help them protect their lions, get people to health clinics and much more." 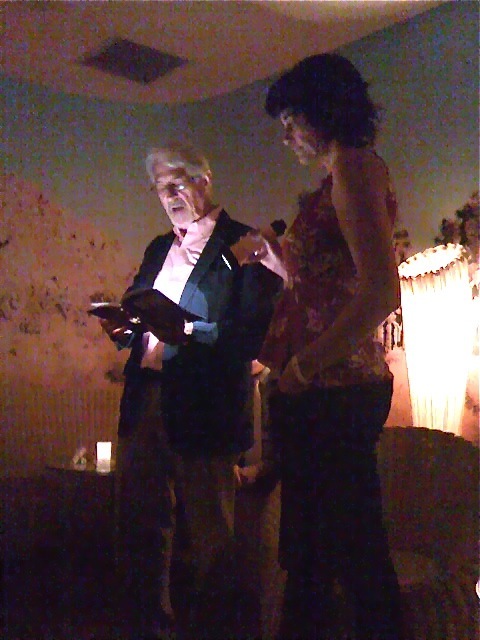 Artillery Magazine hosted an intimate event with art writer Peter Clothier last night at the Standard Hotel in Hollywood. Peter began the evening by reading a bit from his new book Persist and then in an honest vulnerability spoke of his personal and artistic challenges to a supportive audience. Peter encouraged the group to face the inhibiting lies that keep us from reaching our full potential in art and life. Peter explained that his personal lie began at his birth when he was delivered with an umbilical cord wrapped around his neck. A skilled, quick thinking nurse cut the cord but Peter spent much of his life held back by the illusion that "I shouldn't be here. I shouldn't be alive." Peter Clothier has left that illusion behind. In Persist and on his continuing book tour, Peter provides vital clues and encouragement learned through meditation and community to his readers. Congrats to Peter Clothier and to Artillery Magazine publisher Paige Wery for an important event. Artillery Magazine presents a special book reading and signing of Persist: In Praise of the Creative Spirit in a World Gone Mad with Commerce, by writer Peter Clothier. 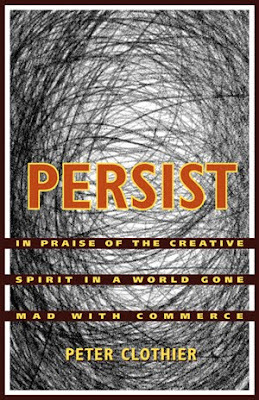 Peter Clothier's Persist: In Praise of the Creative Spirit in a World Gone Mad with Commerce arrives at the perfect time. As the art world tries to reinvent itself in the current economic malaise, Clothier's book inspires us to see the soul and spirit inherent in the creative process. Money may not be the root of all evil but it is the root of a lot of bad art. Peter Clothier challenges artists, writers, actors and filmmakers to value artistic process as a goal in itself rather than a path to wealth and power. Most of all, Clothier urges us to keep on creating - to never give up. The world would be a lesser place without the arts. A beautiful, inspiring book. Highly recommended. "The title, together with the subtitle, pretty much says it all. This latest book is a collection of essays, written over the past thirty years, addressing in a variety of ways the predicament of the artist in a cultural climate in which celebrity and established commerical track record too often count for more than talent and quality of work. Yet artists of all kinds still have to "do it"- if only because that's who they are. The book describes strategies I myself have found to be indispensible in learning to "persist" beyond the all too familiar obstacles: practice, the exercise of mental and logistical discipline, and building community." Peter Clothier has a long and distinguished career as an an internationally-known art writer, novelist and poet. Peter avoids the jargon that obscures much current writing about art by using readily understood language that illuminates rather than obfuscates. Clothier seeks to achieve a harmony of mind, heart, and body in his work, and looks for this quality in the artists he writes about. His work has appeared in the Los Angeles Times, Artscene, ARTNews and other publications. Peter writes a daily weblog,The Buddha Diaries, and is a contributing blogger to The Huffington Post. He also hosts a monthly podcast entitled "The Art of Outrage," on ArtScene Visual Radio." Peter Clothier's latest book is Persist. Available from the publisher at: Peter Clothier's Persist from Parami Press And from Amazon: Peter Clothier's Persist Peter Clothier's blog The Buddha Diaries is continually informative and entertaining. President Obama on Health Care Reform: "We did not fear our future - we shaped it." Good evening, everybody. Tonight, after nearly 100 years of talk and frustration, after decades of trying, and a year of sustained effort and debate, the United States Congress finally declared that America's workers and America's families and America's small businesses deserve the security of knowing that here, in this country, neither illness nor accident should endanger the dreams they've worked a lifetime to achieve. Tonight, at a time when the pundits said it was no longer possible, we rose above the weight of our politics. We pushed back on the undue influence of special interests. 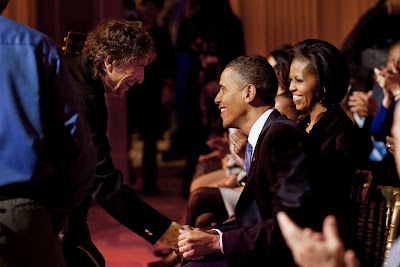 We didn't give in to mistrust or to cynicism or to fear. Instead, we proved that we are still a people capable of doing big things and tackling our biggest challenges. We proved that this government - a government of the people and by the people - still works for the people. I want to thank every member of Congress who stood up tonight with courage and conviction to make healthcare reform a reality. And I know this wasn't an easy vote for a lot of people. But it was the right vote. I want to thank Speaker Nancy Pelosi for her extraordinary leadership, and Majority Leader Steny Hoyer and Majority Whip Jim Clyburn for their commitment to getting the job done. I want to thank my outstanding Vice President, Joe Biden, and my wonderful Secretary of Health and Human Services, Kathleen Sebelius, for their fantastic work on this issue. I want to thank the many staffers in Congress, and my own incredible staff in the White House, who have worked tirelessly over the past year with Americans of all walks of life to forge a reform package finally worthy of the people we were sent here to serve. Today's vote answers the dreams of so many who have fought for this reform. To every unsung American who took the time to sit down and write a letter or type out an e-mail hoping your voice would be heard - it has been heard tonight. To the untold numbers who knocked on doors and made phone calls, who organised and mobilized out of a firm conviction that change in this country comes not from the top down, but from the bottom up - let me reaffirm that conviction: this moment is possible because of you. Most importantly, today's vote answers the prayers of every American who has hoped deeply for something to be done about a healthcare system that works for insurance companies, but not for ordinary people. For most Americans, this debate has never been about abstractions, the fight between right and left, Republican and Democrat - it's always been about something far more personal. It's about every American who knows the shock of opening an envelope to see that their premiums just shot up again when times are already tough enough. It's about every parent who knows the desperation of trying to cover a child with a chronic illness only to be told "no" again and again and again. It's about every small business owner forced to choose between insuring employees and staying open for business. They are why we committed ourselves to this cause. Tonight's vote is not a victory for any one party - it's a victory for them. It's a victory for the American people. And it's a victory for common sense. Now, it probably goes without saying that tonight's vote will give rise to a frenzy of instant analysis. There will be tallies of Washington winners and losers, predictions about what it means for Democrats and Republicans, for my poll numbers, for my administration. This legislation will not fix everything that ails our healthcare system. But it moves us decisively in the right direction. This is what change looks like . But long after the debate fades away and the prognostication fades away and the dust settles, what will remain standing is not the government-run system some feared, or the status quo that serves the interests of the insurance industry, but a healthcare system that incorporates ideas from both parties - a system that works better for the American people. If you have health insurance, this reform just gave you more control by reining in the worst excesses and abuses of the insurance industry with some of the toughest consumer protections this country has ever known - so that you are actually getting what you pay for. And it includes the largest healthcare tax cut for working families and small businesses in history - so that if you lose your job and you change jobs, start that new business, you'll finally be able to purchase quality, affordable care and the security and peace of mind that comes with it. This reform is the right thing to do for our seniors. It makes Medicare stronger and more solvent, extending its life by almost a decade. And it's the right thing to do for our future. It will reduce our deficit by more than $100bn over the next decade, and more than $1 trillion in the decade after that. So this isn't radical reform. But it is major reform. This legislation will not fix everything that ails our healthcare system. But it moves us decisively in the right direction. This is what change looks like. Now as momentous as this day is, it's not the end of this journey. On Tuesday, the Senate will take up revisions to this legislation that the House has embraced, and these are revisions that have strengthened this law and removed provisions that had no place in it. Some have predicted another siege of parliamentary manoeuvring in order to delay adoption of these improvements. I hope that's not the case. It's time to bring this debate to a close and begin the hard work of implementing this reform properly on behalf of the American people. This year, and in years to come, we have a solemn responsibility to do it right. Nor does this day represent the end of the work that faces our country. The work of revitalising our economy goes on. The work of promoting private sector job creation goes on. The work of putting American families' dreams back within reach goes on. And we march on, with renewed confidence, energized by this victory on their behalf. In the end, what this day represents is another stone firmly laid in the foundation of the American Dream. Tonight, we answered the call of history as so many generations of Americans have before us. When faced with crisis, we did not shrink from our challenge - we overcame it. We did not avoid our responsibility - we embraced it. We did not fear our future - we shaped it. 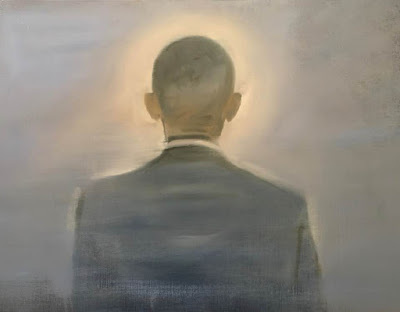 Peter Clothier's new review of my work captures the soul and spirit of my art. "There is an other-worldly quality to Gregg Chadwick's paintings, a sense of liberation from the bonds of gravity that define our physical existence. 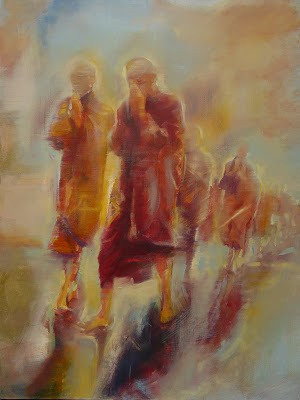 They celebrate the dedication of the monks they portray and convey some of the quiet joy that freedom from earthly needs invests in them. And yet, too, there is an elegiac tone, a kind of nostalgia for a manifestation of the purely spiritual that most of us can never hope to attain. The paintings are truly captivating in that they invite us irresistibly into their spaces and hold the attention there in their swirl of light and color, suggesting inexhaustible depths of experience for the eye to explore." Peter Clothier has a long and distinguished career as an art writer, novelist and poet. 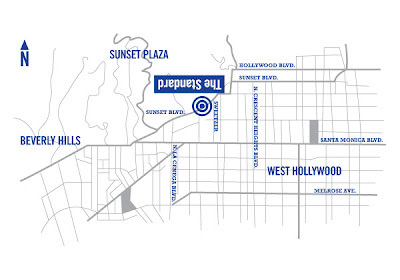 His work has appeared in the Los Angeles Times, Artscene, ARTNews and other publications. Peter writes a daily weblog, The Buddha Diaries, and is a contributing blogger to The Huffington Post. He also hosts a monthly podcast entitled "The Art of Outrage," on ArtScene Visual Radio. 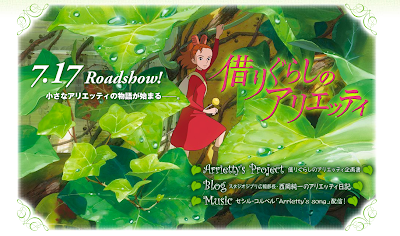 Japanese film artist Hayao Miyazaki has announced that Studio Ghibli's next film, Arrietty the Borrower (Karigurashi no Arrietty ), will be released in Japan on July 17th 2010. The new film is inspired by Mary Norton's novel The Borrowers. Studio Ghibli's free adaptation of the book will be set in Japan in an anime version of the studio's home neighborhood Tokyo Koganei. 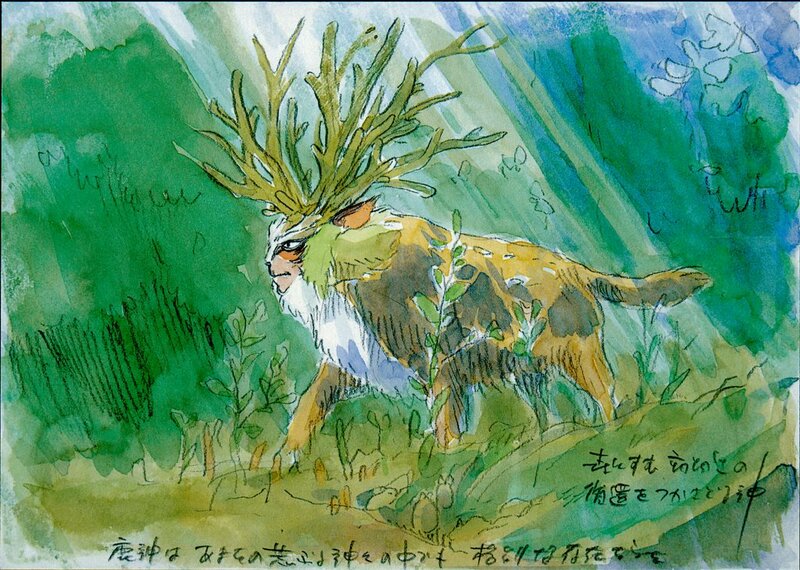 Miyazaki will be overseeing the film but Hiromasa Yonebayashi, at 36 years old, directs the feature. 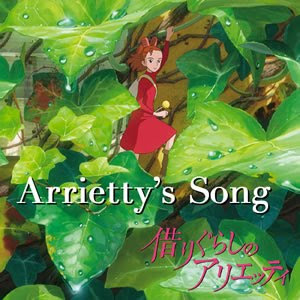 On the occasion of Miyazaki's film retrospective at the Museum of Modern Art in New York in 2005 , AO Scott wrote that after viewing a Miyazaki's film "you may find your perception of your own world refreshed, as it might be by a similarly intensive immersion in the oeuvre of Ansel Adams, J. M. W. Turner or Monet. 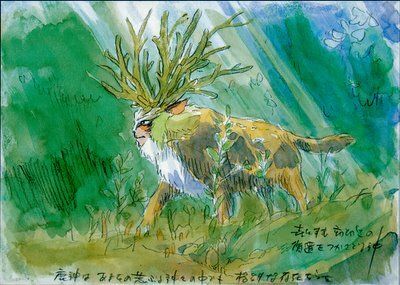 After a while, certain vistas - a rolling meadow dappled with flowers and shadowed by high cumulus clouds, a range of rocky foothills rising toward snow-capped peaks, the fading light at the edge of a forest - deserve to be called Miyazakian." 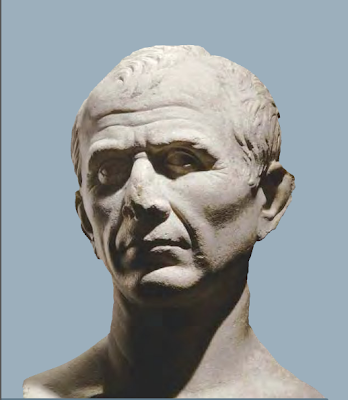 A Roman bust thought by some French historians to be the only surviving statue of Julius Caesar that was carved during his lifetime. 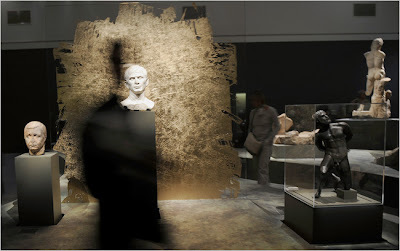 On display at the Musée Départmental de l’Arles Antique. Julius Caesar's assassination in Joseph Mankiewicz' 1953 film version of Shakespeare's play. And Happy Birthday Ralph Heilemann! Noting that this painting of the death of Caesar is in the collection of the Spencer Museum of Art at the University of Kansas, it would behove Kansas - the #1 seed in March Madness - to heed the warning. Is there an NCAA Brutus in the mix? 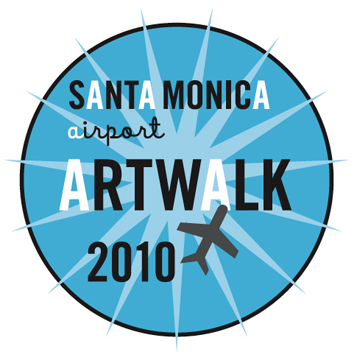 Each year the city of Santa Monica sponsors an Art Walk at the Santa Monica Airport. Often the sound of takeoffs and landings from the tarmac mask the quieter sounds of chisel on stone and brush on canvas in the old hangars lining the historic airfield. A community of artists works quietly alongside the hum of rotor blades and the roar of jet engines. Hidden from the world at large on most days, on March 20th 2010 the artists that call the airport home will open their studio doors and let the public into their creative process. I enjoy this day greatly. The crowd of visitors is convivial and eclectic and represents the diversity that I love in Los Angeles. Last year I missed the event as I was traveling and gathering inspiration in Japan. A number of artworks inspired by this journey to Kyoto and Tokyo will be on display. The event runs from 1pm to 5pm. Please call me on my cell at 415 533 1165 or email me at speedoflife@mac.com if you want to view my studio a bit early or a bit late. Hope to see you on the 20th. Children and friends of all ages are welcome. The Kaaba, originally uploaded by GreggChadwick. 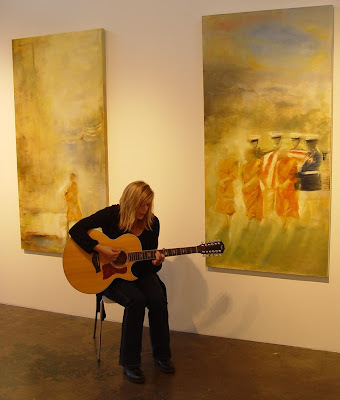 Kelly Colbert Sings her new song 600 Acres inspired by Gregg Chadwick's painting Arlington. The song is a poignant tribute to those lost in the war in Iraq and in particular to the memory of the United States Marine Ahn Chanawongse. "Cpl. Kemaphoom A. Chanawongse enlisted shortly after graduating from Waterford (Conn.) High School in 1999 over the objections of his mother, Tan Patchem. “He understood it was dangerous, and he was proud of doing it,” she said. Chanawongse died after his unit came under attack while attempting to secure a bridge. He had been listed as missing until April 16. Chanawongse, who came to the United States from Thailand at age 9, played youth soccer and planned from a young age to join the military. His grandfather is a veteran of the Thai air force. He was known to members of his unit as “Chuckles” for his sense of humor, and one friend said the avid snowboarder was talkative and outgoing: “Every time you turn around, he’s gone talking to somebody,” said Steve Cava, 22. But he also had a strong sense of duty, his parents said, and had a Marines tattoo on his arm: “U.S. Marine, made in Parris Island.” “He did it without fear and without delay, even one minute,” said his stepfather, Paul Patchem." Sumisan 72"x36" oil and monotype on Japanese Torinoko paper 2010, originally uploaded by GreggChadwick. Kamakura 36"x48" oil on linen 2010, originally uploaded by GreggChadwick. Photographed at the Sherry Frumkin Gallery in Santa Monica. Warfare, Terror, Murder and da Vinci: Paul Strathern's "The Artist, the Philosopher, and the Warrior"
Leonardo da Vinci is an artist whose name is instantly recognizable but whose artwork can seem so familiar to 21st century eyes that the actual paintings feel lost behind a veil of cultural expectations. Paul Strathern's new book, The Artist, the Philosopher, and the Warrior: The Intersecting Lives of da Vinci, Machiavelli, and Borgia and the World They Shaped, allows us to see Leonardo as a living man and artist shaped by his time, friendships and experiences. Strathern's book opens with an epigraph spoken by Orson Welles' character, Harry Lime, in The Third Man. From the vantage point of a ferris wheel high above Vienna, Orson Welles surveys the battered post-war city beneath him and says. "In Italy, for thirty years under the Borgias, they had warfare, terror, murder and bloodshed, but they produced Michelangelo, Leonardo da Vinci and the Renaissance. In Switzerland, they had brotherly love, they had five hundred years of democracy and peace—and what did that produce? The cuckoo clock." "What was it precisely that made Leonardo agree to work for Borgia?" What were Leonardo's "real intentions"? How did Leonardo "become involved with Machiavelli?" Paul Strathern defines his terms with background and analysis of the three major characters. Like Orson Welles, Paul Strathern uses a keen eye and a sense of humor to survey the events surrounding Machiavelli's Florentine diplomatic mission in 1502 which put Leonardo in the service of Cesare Borgia. Strathern vividly describes Renaissance Italy in the 1500's, which was not a unified country under the banner of Italy but instead a collection of constantly battling city states and principalities dominated by Milan, Venice, Naples, Florence and the pope in Rome. The book's narrative introduces us to da Vinci, Machiavelli and Borgia and then weaves, in a Rashomon view, their lives and the events surrounding them from three different vantage points. 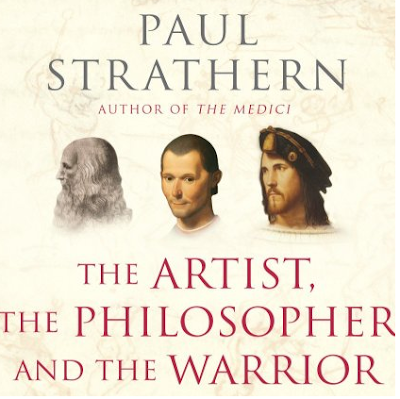 Strathern helps us see the vibrance and struggle of Renaissance Italy from the viewpoints of the artist, the philosopher, and the warrior. In a way that I find new to biographies of Leonardo, Paul Strathern concerns himself not only with the events in da Vinci's life, but especially in how Leonardo learned to think, ponder and dream. Leonardo da Vinci was born as the illegitimate son of Piero da Vinci. Because of the circumstances around his birth, Leonardo was not allowed to receive a classical education and so did not learn Latin as a youth. How did the young da Vinci grow into such a deep thinker? Strathern clearly shows that Leonardo's artistic and scientific investigations were prompted by his own curiosity and massive intelligence. Even without Latin, Leonardo was able to read the classics in translation. Through his study of the Roman author Lucretius, whose epic poem De Rerum Natura (On the Nature of Things) sought to explain the world in scientific terms, Leonardo learned that accurate understanding derives from investigation and experience. "Reflect that the most wicked act of all is to take the life of a man. For if his external form appears to be a marvelously subtle construction, realize that this is nothing compared with the soul which dwells within this structure." Leonardo "served with no apparent show of unwillingness (even in the privacy of his notebooks), as military engineer to the ruthless murderer Cesare Borgia, a monster whose name would enter history as a byword for infamy." Perhaps an answer can be found in the zeitgeist of the era. As Strathern explains, the Renaissance prompted a more rational humanist outlook in the worlds of art and literature, but medieval fears and prejuidices remained strong. In troubled times, a collective mania could take hold. A similar, collective mania, took hold in the United States after the terrible events of September 11, 2001. This collective mania was hidden in the richly nuanced shadows in Leonardo's paintings. Caught in the sfumato in "The Adoration of the Magi", now in the Uffizi Gallery in Florence, warriors on horseback battle. 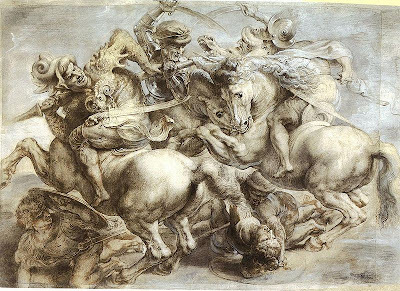 Lost to time, but remembered in Peter Paul Rubens' restoration and reworking of an Italian 16th-century drawing, horses lock forelegs and armored soldiers scream as they battle for the standard in Leonardo's Battle of Anghiari. Like a figure from da Vinci's Battle of Anghiari, Cesare Borgia died on a battlefield. "For four hours, I forget all my worries and boredom. I am afraid neither of poverty nor death. I am utterly absorbed in this world of my mind. And because Dante says that no one understands anything unless he remembers what he has understood, I have noted down what I have learned from these conversations. The result is a short book, called The Prince, in which I delve as deeply as I can into the subject of how to rule." Leonardo da Vinci left a legacy of unpublished volumes, uncast sculptures, unrealized engineering projects, and unfinished paintings. Strathern theorizes that Leonardo's time with Cesare Borgia was brutish and caused Leonardo to doubt that humans were essentially good. 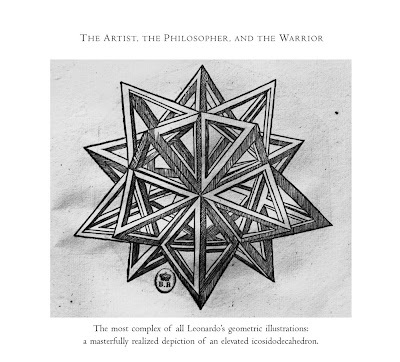 Among diagrams and plans for weapons and machines, Leonardo wrote, "I will not publish or divulge such things." Leonardo saw the evil nature in men and did not trust humanity with his genius. A weapon, elegantly realized with a quill pen on a sheet of costly paper, becomes horrible when realized in the physical world and used to tear flesh and bone. Ultimately, Leonardo's discoveries lay hidden for centuries. Leonardo's inability to finish his projects had aesthetic reasons as well. Since the classical age, unfinished artworks were cherished because they seemed to reveal the living thoughts of the artist. Leonardo da Vinci saw that an initial sketch captured the very instant of inspiration. Inspiration was valued as being more urgent and vital than a finished work of art itself. 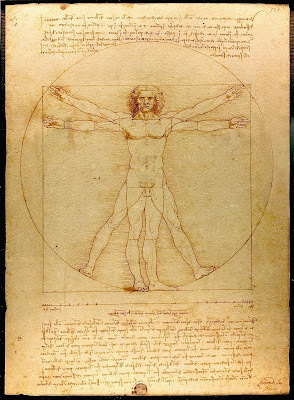 The initial idea or conception is what truly mattered to da Vinci. Once Leonardo had grasped the artistic idea, a finished work of art already existed in his mind. Strathern's The Artist, the Philosopher, and the Warrior: The Intersecting Lives of da Vinci, Machiavelli, and Borgia and the World They Shaped lights a darkened era. From the smoky depths of sfumato glazes we peer into da Vinci's world of nuance and suggestion. In Leonardo's artistic legacy and Strathern's satisfying book we are left with existential questions, mere hints about our time on earth and the threads of history and influence that link us to the past.